We all know about perms — the curling process that uses chemicals and cylindrical rods to permanently curl a head of hair. But have you ever heard of perming your LASHES? We hadn't either. That is until we took a trip to Salon Sovay, a boutique salon located here in Austin, TX, where the owner, Sovay Reeder, is one of the few estheticians who executes this unique process to create the perfect curl for your lashes. 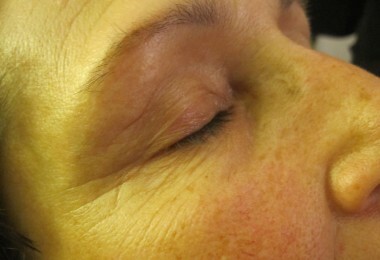 An eyelash perm lasts for about two to three months and requires zero upkeep. Combining the process with lash tinting — permanent lash dyeing — creates a fully-mascara-ed look that requires no maintenance. "Women should look as beautiful as possible with as little maintenance as possible," explained Sovay, who intentionally keeps the price points of the process low in order to make it easily accessible. Cleanse and Protect: Make sure the lash and eye area is totally free and clean of eye make-up. Strips of tape are placed beneath the eye to protect the delicate undereye skin from any drips. Set the Stage: Select the size of the perm rods and use tweezers and glue to apply lashes to the rods. Perm Away: Apply the perm solution. Leave on fine lashes for 10 minutes, coarse lashes for 15 minutes. Neutralize: Set the protein bonds of the lashes in a new shape by neutralizing. And voila — perfectly, curled lashes without a curler or mascara! Lash curl patterns are very similar to hair curl patterns. Persons of African descent typically have curlier lashes than other ethnicities. 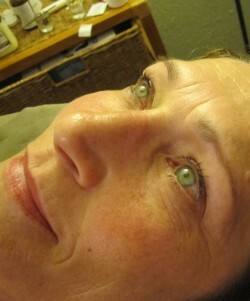 A "reverse" lash perm can be used to "relax" curlier lashes and extend their length. Final permed and tinted lashes! Absolutely gorgeous! A combination eyelash perm and tint produces beautiful results leaving you mascare free for months on end! The best lashes for the process are those that are not too curled already and are lighter in natural shade. Lash Perming is a chemical process and because of its proximity to your eyes should absolutely be done ONLY by a professional.